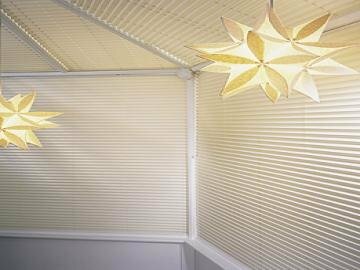 Pleated blinds are available as a free hanging blind for vertical windows or Skylight for angled windows, velux and roof blinds. They can even be made into various shapes making them ideal for conservatory roofs. They can provide a contemporary design and effect. Coming in special technical fabrics with a solar protective backing to keep heat and solar glare out. 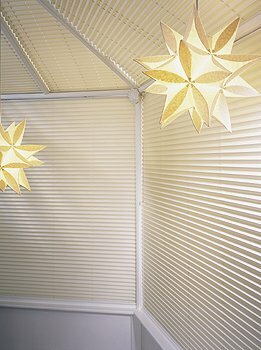 All pleated blind fabrics are also treated with "Scotchguard" to eliminate staining. They also have a small stack at the top when raised fully, leaving windows clear. Because they have a very tight tolerance and snug fit, it makes them ideal for use on velux windows. 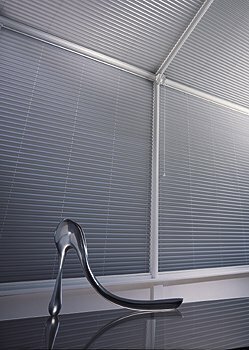 Our pleated blinds also use the uni-pleat system which stops pleats from sagging and keeps blinds in shape at all times. 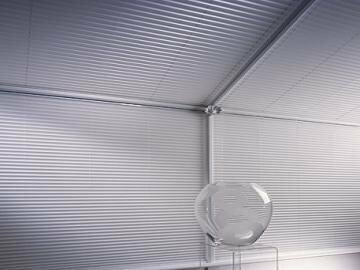 Keeping the glare out in summer and adding warmth in the winter they make your conservatory or sunroom into an extension of your home. 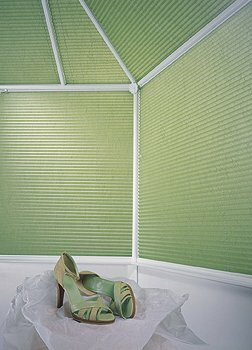 Remember a conservatory without blinds is a greenhouse!! !